It's now clear that 1996 was a turnaround year in Cristiano Ronaldo life. 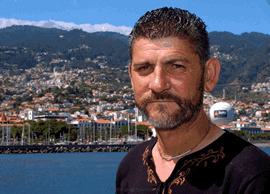 By joining Sporting CP, Ronaldo had to leave his family back in Madeira and start learning how to live on his own. 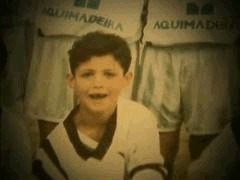 CR7 trained with the youth team in the first years and in 2002, by the age of 16, he made his senior debut against Moreirense, in the Portuguese First Division. In that match, Ronaldo scored a brace and immediately caught everyone's attention upon him. After that game, everyone realized a new star was born and Ronaldo wouldn't stay in Lisbon for too long. The European debut took place just a few days later, in the UEFA Champions League qualifier match against Inter Milan. By the age of 17, Cristiano Ronaldo really started to attract many attentions throughout the World, and his tremendous performances when playing for Portugal's Youth Team in UEFA's Under 17 Championship, made him one of the most promising stars of the moment. Among many other top clubs, Liverpool and Arsenal had some scouts on that tournament. Managers Gérard Houllier and Arsene Wenger were allegadly interested in signing Cristiano Ronaldo. 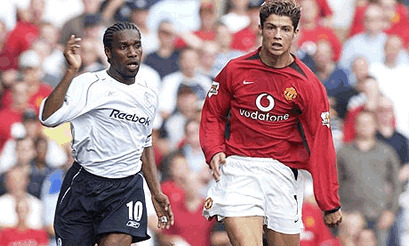 However, it was revealed later that both clubs got a bit hesitant on betting in such a young player and Manchester United ended up to rush things and sign Ronaldo in the 2003-04 pre-season. The moment Cristiano Ronaldo definately convinced a top club to sign him, was after a 2003 pre-season friendly match, between Sporting and Manchester United, in the inauguration of the "Estádio José de Alvalade" in Lisbon. Against what many experts had predicted, the Portuguese side defeated the Red Devils by 3-1 and United players were said to be stunned by Cristiano Ronaldo's technique skills as well as his natural talent and kept talking about it on their way home. Rumors say that Sir Alex Ferguson had a chat with his team players and then decided to sign Cristiano Ronaldo, in a transfer fee around 15 million euros (£12.24 million pounds). 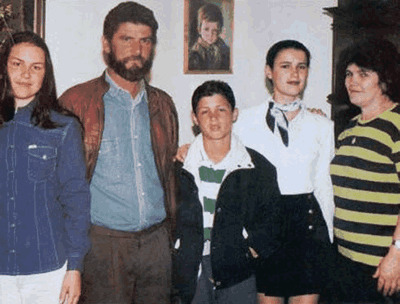 In the year of 2005, Cristiano Ronaldo's father, José Dinis Aveiro, died of an alcoholism liver disease. Ronaldo was 20 years old and that was one of his most difficult moments of his life. CR7 is said to not drink any alcohol as a consequence of what happened with his father. The following season, Cristiano Ronaldo upped the ante on their sports bet, with Ronaldo putting his hair on the line by promising to completely shave his head should he fail to score 20 goals. However, the bet was eventually declined by Ronaldo himself, after Sir Alex Ferguson requesting for the Portuguese to score 35 goals during that season. Regarding the Portuguese National Team, Cristiano Ronaldo made his senior debut against Kazakhstan a few weeks later, just after being signed by Manchester United, in a match played in August 2003. CR7's first biggest tournament was the Euro 2004, organized by Portugal and Ronaldo managed to help his team reaching the finals, but ended up by being defeated by Greece. Cristiano Ronaldo photos in tears after the match were the Portuguese soul mirror that afternoon and those images got spread all around the World. A couple years later, in the World Cup 2006 played in Germany, Ronaldo was caught up in a very big controversy, after allegedly pressuring and influencing the referee to send off his Manchester United team mate and England's striker/forward Wayne Rooney, in the quarter finals clash between England and Portugal. Cristiano Ronaldo ended up being used as the scapegoat for England's defeat in the World Cup and the hatred towards him the following season, could be seen on every stadium the Red Devils had to play. English fans showed CR7 how much they got upset with the World Cup elimination and started insulting and "booing" Cristiano Ronaldo on every match outside Old Trafford. That situation made CR7 think about leaving England and Manchester United. However, Sir Alex Ferguson managed to convince him to stay and, against all odds, Cristiano Ronaldo surprised everyone with a great season in the English Premiership League. 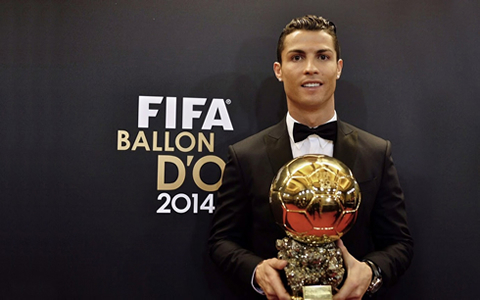 Ronaldo was quoted saying: "All the boos and insults just motivate me training harder and playing better". 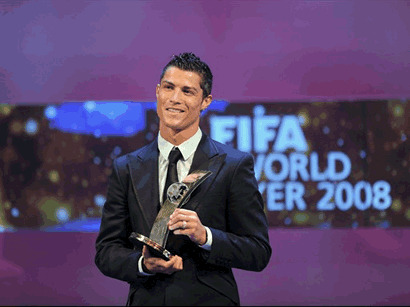 In 2007, Cristiano Ronaldo won the PFA Player and Young Player of the Year Award and was also voted Footballer of the Year, by the Football Writers Association. That same year and for the first time, Ronaldo also made up to the top 3 finalists for both the FIFA World Player of the Year trophy and the European Player of the Year award. Cristiano Ronaldo kept on his outstanding form in the 2007-2008 season and scored 42 goals in all competitions (31 in the English Premier League), allowing him to be voted again for the PFA Player of The Year and the Football Writers Footballer of the Year. CR7 rising performances allowed Manchester United to win two titles that season, those being the English Premier League and also the UEFA Champions League trophy, in which Ronaldo scored a goal in the final, after a superb header. The 2008 year was definately Cristiano Ronaldo glory year at Manchester United and after having won the UEFA Champions League, Ronaldo won the FIFA World Player of the Year (2008) and the European Player of the Year (2008). 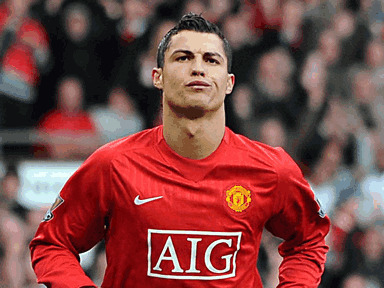 In the 2008-2009 season, Cristiano Ronaldo scored another 26 goals, which helped Manchester United to win another English Premier League title and reaching again the final of the UEFA Champions League, in which they ended by losing against Barcelona this time, by 0-2. 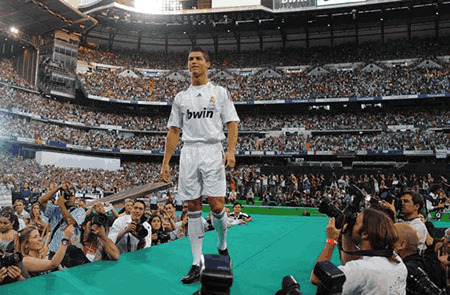 In 2009, Cristiano Ronaldo broke another record by becoming the World's most expensive football player, after transfering from Manchester United to Real Madrid in July 2009, in a £80 million pounds transfer (around 94 million euros and 132 million US dollars). That was an historic moment, and more than 80 000 fans received and welcomed Cristiano Ronaldo in the Santiago Bernabéu stadium, during his official presentation. Ronaldo's career in Real Madrid started well, scoring plenty of goals on his first matches and only getting stopped by his first injury, in October 2009. However, CR7 recovered his form a few months later and still managed to score 33 goals on his first season playing for Real Madrid, which unfortunately, didn't prove to be enough for the club to win any trophies in the 2009-2010 season. As for the Portuguese National Team, Cristiano Ronaldo captained Portugal at the 2010 FIFA World Cup played in South Africa, but the "Lusitanos" got eliminated in the last 16, against the future World Champions, Spain, getting defeated by 1-0. In the 3rd of July, 2010, Cristiano Ronaldo announced on his facebook page that he had become a father. The information shocked many fans since there's still a big mistery nowadays, on who is the mother of the Cristiano Ronaldo's son. CR7 requested privacy and named his son with his own name, Cristiano Ronaldo Junior. The child is currently in Ronaldo's full custody, while being helped by his mother and sisters. In the 2010-2011 season, Cristiano Ronaldo had an outstanding personal performance, breaking several all-time records, not only in Real Madrid, but also in the Spanish League. Ronaldo scored 41 goals in La Liga, breaking the previous 38 goal record set by Hugo Sanchez and Telmo Zarra. CR7 scored a total of 54 goals and once again, won the Golden Boot award, beating Lionel Messi in the way, who finished the season with 53 goals. However, not everything was perfect, since Real Madrid only won the Copa del Rey and failed to conquer the Spanish League and the UEFA Champions League. The 2011-2012 season will always be a memorable one in Real Madrid's history. With Cristiano Ronaldo leading the charge game after game, the Merengues ended with Barcelona's hegemony in Spain and won the Spanish League in a record-breaking fashion. The club reached 100 points that season, the highest ever registered until then, but also broke the record for goals scored, with 121 in 38 games. The Champions League journey ended once more in the semi-finals round, in a penalty shoot-out decision against Bayern Munich. As for the Copa del Rey, Barça knocked out Real Madrid with a 4-3 result on aggregate. Ronaldo had his highest goalscoring season ever, with 60 goals out of 55 games (46 of those goals were scored in La Liga). Following that monumental season, Ronaldo went straight ahead with Portugal into the EURO 2012 that was going to be held in Poland and Ukraine. Unfortunately for the "Lusitanos", the team ended up falling short to the expectations and got knocked out at the semi-finals against Spain, during the penalties shoot-out. Nevertheless, Cristiano Ronaldo has undoubtedly been one of the best players of the tournament, with three goals scored and several great performances that allowed him to earn a well deserved pick for the "UEFA EURO 2012 Team of the Tournament". The 2013-2014 season commenced with immense hope and expectations from the Los Merengues after coach Carlo Ancelotti took over as manager. Real Madrid began their campaign strongly, with Ronaldo looking in great form. The season played out to be an exceptionally successful one with Real Madrid's quest for their long awaited "La Decima" finally ending, as they beat their city rivals Atletico Madrid in a hard fought Champions League Final. This saw Ronaldo win the Champions League for the second time in his career, but the first time for Real Madrid. He set the record for scoring most goals in a single season in the Champions League, by registering an astonishing 17 goals in just 11 appearances. Los Blancos, finished 3rd in La Liga that season, behind Atletico Madrid and Barcelona. But, Madrid still managed to win the Copa Del Rey with Ronaldo playing a crucial part, although missing the final against Barcelona due to injury. Furthermore this season, Ronaldo's wait for his 2nd FIFA Ballon d'Or was finally over, as he won it for the first time since joining Real Madrid. He ended the season as Real Madrid's top goal scorer with 51 goals in just 47 appearances, winning him the European Golden Shoe for the 3rd time in his career. After a frustrating performance in the 2014 Brazil World Cup, Ronaldo started the 2014-2015 season with Real Madrid in magical form. This saw Madrid win both the UEFA Super Cup and FIFA Club World Cup still before the turn of the year. Benefiting from his continued momentum and miraculous form in front of the goal, Ronaldo won his 3rd FIFA Ballon d'Or, beating Messi and Manuel Neuer to it. Madrid also went on a 22-game winning streak in all competitions in the 2014-2015 season, only to have it ended by a 2-1 loss to Valencia. Cristiano scored a superb 28 goals during this run. Real Madrid finished the season at second place in La Liga, just 2 points behind winners Barcelona. Los Blancos also made it to the semi-finals of the Champions League, but failed to beat Juventus. Statistically, however, this was Ronaldo's most successful season in his career, as he ended the season scoring an incredible 61 goals in just 54 appearances. Scoring 48 goals in La Liga, helped him win his 4th European Golden Shoe and also the Spanish Pichichi award. With Carlo Ancelotti sacked, Los Blancos began their 2015-2016 campaign by appointing Rafael Benitez as their head coach. Under his regime, some key Real Madrid players seemed unhappy. Moreover, the club president Florentino Perez was not satisfied with the results and this led to Benitez's contract being terminated in just 7 months. Club legend Zinedine Zidane was appointed as manager, with whom came loads of expectations. Having being expelled from the Copa del Rey under Benitez after an administrative gaffe for fielding an ineligible player (Cheryshev) against Cadiz, Zidane's focus was only on the Champions League and La Liga. Ronaldo started the season slowly receiving much criticism for his fall in form and was often accused of not performing in big games. Under Zidane, however, Ronaldo clearly seemed more happy and settled, and this showed in his performances. Real Madrid fought hard in the La Liga race, missing out on the title to arch rivals Barcelona by just 1 point. Nevertheless, Los Merengues ended their season on a high by winning the "Undecima"- their 11th European title. Real Madrid faced their city rivals Atletico Madrid in the final for the 2nd time in 3 years. With the game tied at 1-1 after extra time, Los Blancos managed to steal the win in an intense penalty shootout winning it 5-3, with none other than Cristiano Ronaldo scoring the winning penalty. This Champions League season was yet another remarkable one for Cristiano, as he had several stand out performances and scored 16 goals in 12 games, just 1 goal shy of his own record-breaking tally of 17. Furthermore, Ronaldo scored a total of 51 goals in 48 appearances during the season, becoming the first player in history to ever to score more than 50 goals for 6 consecutive seasons. CR7 summarized his season perfectly after Real Madrid's quarterfinal comeback against Wolfsburg in the Champions League: "All in all, for a poor season, it's not so bad... I'm very happy." 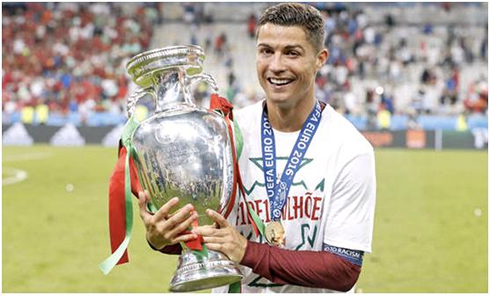 Following a successful Champions League campaign, Ronaldo switched his focus to the upcoming EURO 2016 tournament held in France. Having been placed in a group with Iceland, Austria and Hungary, Portugal were favorites to finish on top of their group. High hopes were placed on Cristiano, as this could be his best and perhaps last chance to win major silverware for his country. However, Portugal could not start the tournament as well as they hoped as they were held to a 1-1 draw by Iceland. The following two games also saw Portugal frustrated to draws by both Austria and Hungary. Ronaldo opened his account for EURO 2016 in Portugal's last group match against Hungary, scoring 2 goals in the game. Portugal's underwhelming performance saw them scraping through group stage with a 3rd place finish. This was just enough for them to qualify for the Round of 16 where they played Croatia. Portugal narrowly won their clash against Croatia, with Ricardo Quaresma scoring in the dying minutes of extra time. Portugal next faced Poland in the quarter-finals, whom they beat in the penalty shootouts. Ronaldo's leadership qualities where on display during the penalty shootout, as he motivated and convinced João Moutinho into taking a penalty. Moutinho went on to score and Portugal won the penalty shootout 5-3. Portugal's performance in the tournament received high level of criticism as they had failed to win even 1 game convincingly and in normal time. Nevertheless, Portugal advanced to the semi-finals where they were matched against Gareth Bale's Wales. All critics were shut down after Portugal eased past Wales, winning the match 2-0 in normal time, with Ronaldo scoring the first goal. Portugal were now to meet host nation France in the Stade de France for the finals. 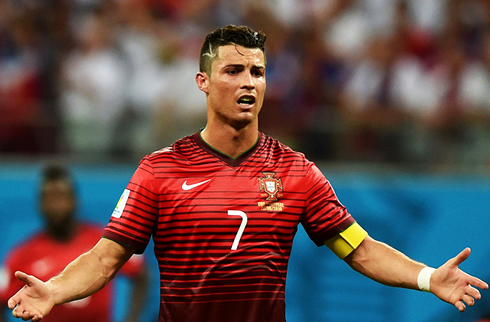 Portugal were treated to huge disappointment soon into the final. Cristiano Ronaldo suffered a knee injury after a clash with Dimitri Payet and was left sobbing as he realized his dream of leading Portugal to European glory was over, forcing him to go off the pitch in a stretcher just 24 minutes into the game. Ronaldo however, quickly returned to sidelines to encourage his teammates through the rest of the game. Portugal stunned the host nation and claimed victory after a powerful strike by Éder, who smashed home the winner 4 minutes into the second period of extra-time. Ronaldo was seen besides the Portugal coach Fernando Santos for the majority of extra time. Cristiano played his role of a true captain and leader by motivating, encouraging and inspiring his teammates as much as he possibly could while being on the sidelines. Ronaldo was also extremely animated and he found it difficult to contain his nervousness and excitement as his tears of despair soon turned into that of joy. 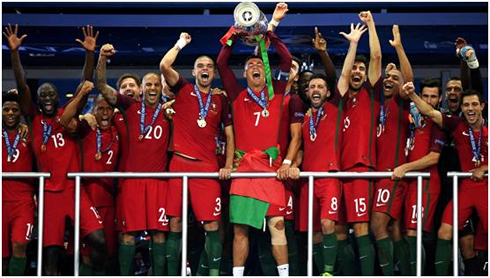 This win meant Portugal lifted their first major European trophy, with Ronaldo now favorite to collect his 4th FIFA Ballon d'Or in January 2017.